Jim Lee began his career at Marvel comics in the mid-1980s. Rising in popularity at a rapid pace, he soon took over the company's flagship title and made it his own: The X-Men. 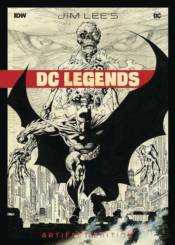 In the '90s, Lee formed his own company, WildStorm Productions, which was later bought by DC Comics, allowing the artist the opportunity to draw the adventures of some of comics' oldest and most iconic superheroes: Batman, Superman, and Wonder Woman, to name a few. This Artifact Edition will focus on the last 25 years of Jim Lee's storied career, showcasing his rendition of the Dark Knight Detective, as well as the last Son of Krypton, all the while placing his own unique stamp on each character. As with all Artifact Editions, each page will be scanned from the original art, offering a unique look at the creative process of one of the most popular and creative artists working in the field. The only way you could get a better look at Jim Lee's original art is if you were sitting next to him at his drawing board! Additionally, there will be examples of WildC.A.T.s and other pre-DC work. Advance solicited for September release! IDW Publishing pioneered Artist's Edition type books and to date they have won five prestigious Eisner Awards. TIME OUT SHORTLIST: GOTHAM METROPOLIS GUIDEBOOK SOFTCOVER WALLY WOOD THUNDER AGENTS ARTIST EDITION PORTFOLIO ED.